Cider, The Gateway Drug To Beer! Hey, I thought that West Coast Brewer was a home beer brewing site, why are you making cider? Yes, it is a homebrewing blog; but I figure that cider making is in the same wheelhouse and that I would share what I learned on the topic in case anyone else was interested in making a batch. The idea of making a batch of cider came to me when I was considering what I wanted to fill my next batch of kegs with. My goal was to having something for everybody. That got me thinking. We all know one of those people who is “Not a beer person”. Whenever I hear someone mutter those words I immediately think that they just have not found the right beer or had a bad beer experience where instead of someone easing them in to beer, they pushed a double IPA on them or gave them a poorly made sour. Although Hard Cider is not beer, many people consider them to be somewhat synonymous with one another and it has to be one of the most approachable alcohols on the planet. It has a low ABV, it is relatively sweet, can be bubbly and has next to no bitterness; it is the gateway drug to beer! Making cider is easy! Making good cider is a bit more difficult but not too hard if you have the right equipment and a little bit of patience. The good news is that if you are a home beer brewer, you probably have just about everything that you will need in order to make a batch of cider. If not, do not worry, I will go over all of that with you. So you have a few options. If you are happy with mediocrity, I highly recommend you purchase a cider making kit! For approximately $45, you can purchase a Mangrove Jack apple cider kit and create a 5 gallon batch of hard cider that will produce somewhere between a bad and mediocre cider. These kits come with all of the ingredients that you will need, include instructions and make the process very simple. 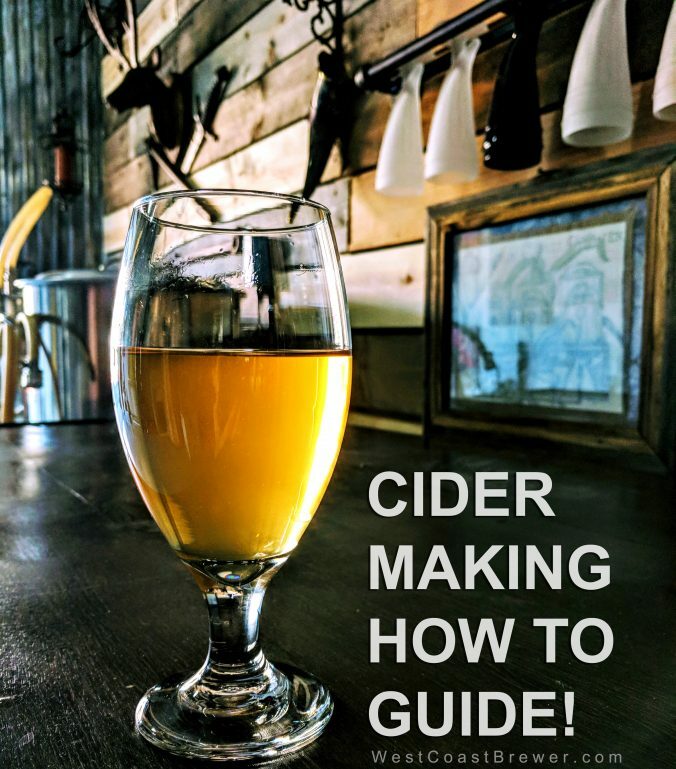 It may not be the best cider you have ever tasted, but it you have never made cider before and have no home brewing experience, this may be a great way to go. You can purchase a Mangrove Jack Apple Cider kit here. You can also find some helpful information on making cider from a kit at HomebrewingDeal.com. Clean and sanitize your fermenter and anything that will come in contact with you cider. If you need a food grade sanitizer, I highly recommend Star San Sanitizer. Add your yeast, I like Wyeast 4766 or Cote Des Blancs dry wine yeast; both are great choices for cider yeast. If possible, take a specific gravity reading. Make sure that your gravity is above 1.045 or else you may have stability issues with your finished cider. You can add additional apple juice concentrate if needed to boost your gravity. Next seal your fermenter, place it in a temperature controlled location and let it fermenter for 2-3 weeks until your fermentation has completed. Once your fermentation has completed there are just a few more tweaks. Crush 5 campden tablets and mix it with 1 teaspoon of potassium sorbate and it to your cider. If possible, drop your fermentation temperature down to 45F. Wait 24-48 hours. At this point your fermentation should be completely halted. I use a keg partially because I am lazy and partially because it is the best choice. If you want your cider to be carbonated and you chose to back sweeten or add fruit to it, kegging is your only reasonable choice. Otherwise you will need to add yeast to it once again to force carbonate it in the bottle and risk both over carbonating and undoing all of the effort you placed in to back sweetening the cider in the first place. If you keg, you are able to bottle once the carbonation level that you desire is reached and the cider will come out much cleaner! Clean and sanitize your keg and anything that will come in contact with the cider. Transfer your cider from the fermenter to the keg, doing your best to avoid drawing in any of the particulates that have settled to the bottom of your fermenter. Add oak sticks or oak cubes to the keg for additional complexity if desired. I think it adds a nice touch to the cider. Oak takes time to impact the flavor of your cider, so as it ages in the keg its flavor will become more noticeable. Let the cider carbonate and condition in the keg for approximately 2 weeks. Your first few pours from the tap will be a little cloudy but after that it should begin to clarify rapidly. That is it. If all goes well, you should now have a delicious glass of cider in front of you! Please let me know how yours turns out or if you have any comments, questions or suggestion.